This article is about the creatures called Pikmin. For the WarioWare: D.I.Y. microgame, see Pikmin (microgame). Pikmin are a plant-animal hybrid species and the namesake of the video game series they star in, Pikmin. These beings inhabit the planet PNF-404, and spend time buried in the ground, with their leaves sticking out. In the series, they are plucked out the ground by the player to use in battles and such. They have made crossover cameos in Mario games a few times, but their most important role was with the introduction of Captain Olimar as a playable fighter in Super Smash Bros. Brawl. The Pikmin's first appearance in the Mario franchise was in Mario Golf: Toadstool Tour. Here, if the golf ball landed in a patch of flowers, Pikmin would pop out. Olimar, along with a group of Pikmin were going to appear in Mario & Luigi: Superstar Saga when a new type of coffee was made at the Starbeans Cafe. He would call Mario 'Marlio', an anagram of Olimar and mistake Luigi for a dangerous beast and order his Pikmin to attack him. 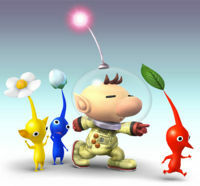 Pikmin serve Captain Olimar in Super Smash Bros. Brawl. Although they are technically not playable, Olimar is almost completely helpless without them, for they are featured in all of Olimar's special moves, smash attacks, aerial attacks (except for his neutral aerial), and grabs. As such, they must be plucked from the ground. When Kirby gains Olimar's ability, he can also use Pikmin, but after plucking them, he immediately throws them. A group of Pikmin start to attack a giant R.O.B. which simply rises its arms and spins around knocking them all off and kills most of them. Captain Olimar is shocked and scared, however his Red Pikmin informs him of a new visitor. The Blue Falcon speeds through the forest. Captain Falcon jumps out of the car, and Falcon Punches the robot, sending it flying away. Landing after his attack, Captain Falcon accidentally kills many of the Pikmin, but teams up with Olimar, regardless; and the pair run along some old ruins fighting the Subspace Army. They notice an Arwing attacking the ship carrying Donkey Kong: Falco Lombardi drops Diddy out of his Arwing, and with his Peanut Popguns, the monkey shoots the ship holding Donkey Kong. Captain Falcon and Captain Olimar run to assist. Pikmin return as Olimar's aids in Super Smash Bros. for Nintendo 3DS / Wii U. This time, Olimar appears as "Olimar & Pikmin" on the character selection screen, unlike in Brawl, where he was listed simply as "Captain Olimar". Olimar can only have three Pikmin following him unlike the predecessor which allowed six. His up-B attacked now involves being carried by winged pikmin. The more Pikmin Olimar has following him, the slower the Winged Pikmin fly. The same Pikmin from the previous installment return alongside Olimar in Super Smash Bros. Ultimate. Pikmin later appear in the microgame Pikmin 2 in WarioWare: Smooth Moves, which belongs to 9-Volt. 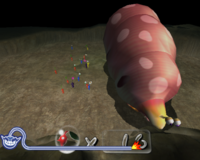 Here, the player controls Empress Bulblax and must roll over all of the Pikmin to squish them before the time runs out. However, as the difficulty increases, the Pikmin grow larger and start jumping over the player. In the WarioWare: D.I.Y. microgame Pikmin, the player controls Captain Olimar, who is holding a Red Pikmin in his hand. The point of the game is to throw the Pikmin onto the rock that contains nectar. If time runs out or if the Pikmin is accidentally thrown into the water, the game ends in a loss. A trailer for the first Pikmin game featuring the eponymous species appears in Luigi's Mansion's option screen. More likely to be plucked from snow or clouds. GCN Pikmin A type of Pikmin--which are odd beings who grow like plants yet are as mobile as animals. Red ones are heat and fire resistant and are strong attackers, which makes them valuable when facing dangerous foes. Purple Pikmin are also tough fighters, but since it's difficult to increase their numbers, red Pikmin are easier to manage. Red Pikmin have distinct pointed noses. GCN Pikmin A type of Pikmin, which are curious creatures that follow and obey the person who picks them. If you take advantage of this trait, you can get them to help Capt. Olimar and Louie. The blue Pikmin are at home in water and cannot drown. Need to retrieve an object underwater or cross a water hazard to disarm a trap? Blue Pikmin are just the allies you need. GCN Pikmin A type of Pikmin. Take a nutrient- rich pellet to a flying saucer known as an Onion, and it will produce the mysterious beings known as Pikmin. Yellow ones fly higher than other Pikmin when tossed by Olimar or Louie. Unlike other Pikmin, they're also highly resistant to electricity, which makes them invaluable when battling enemies like anode dweevils. GCN Pikmin 2 A type of Pikmin. White Pikmin are resistant to poisons and are themselves toxic to creatures that eat them. Their low weight makes them very speedy, and they can also dig up buried items. White and purple Pikmin do not live inside Onions, so you must change other Pikmin into them by tossing them into ivory candypop buds and violet candypop buds. GCN Pikmin 2 A type of Pikmin, much heavier and slower than other Pikmin. When thrown, they impact with such force that they may kill or stun enemies. They're also incredibly strong--one of them can carry an item that normally would require ten Pikmin. While they're more powerful fighters than their red cousins, their slow speed hampers their effectiveness. GCN Pikmin 2 (08/2004) This Pikmin has a red body and a long, pointy nose. It was the first type of Pikmin Olimar ever met. In Smash Bros., they have the second highest attack power among the Pikmin. Like their fiery color suggests, they can attack with flames and withstand them. Telling Red Pikmin apart from the other Pikmin is easy: these ones have long, pointy noises. Also, they're red. They're the very first kind of Pikmin Olimar finds on their planet, and their high attack power makes them very useful. In this game, they can deal powerful attacks, and they're very resistant to fire damage. GCN Pikmin 2 (08/2004) This blue Pikmin walks around with its mouth ajar. At home in the water, they're very helpful when objects are submerged and need retrieving. In Smash Bros., blue Pikmin have defense second only to purple Pikmin. They are also able to do more damage when thrown, so don't be shy about hurling them at foes. The things that make blue Pikmin different from all the other Pikmin are that they have mouths and that they're pretty good swimmers. They're slightly hardier than most other Pikmin, and they do more damage when you throw them. So, as soon as you get one of these, make sure to throw it right at someone straight away! GCN Pikmin 2 (08/2004) This yellow Pikmin is sporting some pointy things on its head. Maybe those are ears? Hmm... Anyway, yellow Pikmin are immune to electricity and are the lightest Pikmin in the Pikmin series. In Smash Bros., a thrown yellow Pikmin will fly through the air in a nice curve, zapping anyone it comes in contact with. Yellow Pikmin have big, sharp ears and conduct electricity very well. These two facts are most likely unrelated. Olimar's side special can throw this Pikmin high into the air and cause electrical damage to all fighters who stray too close! Wii U Pikmin 3 (08/2013) These tiny, white Pikmin have bright-red eyes. They are the fastest of the Pikmin, perfect for finding and retrieving hidden treasure. In Smash Bros., you can use them to poison your enemies. Since they can fly the farthest of any Pikmin when thrown, use them to poison enemies from afar. These small, fast-footed Pikmin are white with red eyes. That ominous look they have might give you the chills, and you'd be right to be scared - the little blighters are poisonous! In this game, they'll hang on to any enemy you throw them at and generously share their venom with them. Wii U Pikmin 3 (08/2013) These purple Pikmin are the strongest, but they're also slower and heavier. In Pikmin, they can be thrown at animals to stun them! In Smash Bros., they're great for attacking and launching, but they've got a pretty short reach. Get close to your foe to make these little ones truly effective! These purple Pikmin are much stronger than their colourful counterparts, but they're also slower and heavier. In Pikmin, they can be thrown at animals to stun them! In this game, they're good at both attacking and launching, but since they haven't got good reach, you'll need to get up close and personal with your foes first! Wii U Pikmin 3 (08/2013) These Pikmin are made of solid rock, so they can stand up to a lot of attacks and won't get hurt when they get stepped on. They specialize in body blows, dealing a lot of damage when thrown, and they can also break right through glass and crystal. They can't latch on to other creatures, though. But that's OK—nobody's perfect! Wii U Pikmin 3 (08/2013) These pink Pikmin have big, blue eyes and nice wings to help them fly. In Smash Bros., they show up to carry Olimar and friends through the air. However, how high and far they can fly is affected by how many friends they have to carry. More Pikmin will weigh them down. This particular type of Pikmin has a pink body, blue eyes and...wings? Yep, they can fly, and in this game, they can even give Olimar a lift. The only thing is they'll get tired very easily, especially if they're carrying lots of other Pikmin at the same time. Go easy on them, OK? A group of Pikmin appears on a Character Card packaged with the Nintendo 3DS, one of five (which also feature Nintendo characters) used with the Augmented Reality Games software. Five of the colored varieties of Pikmin each represent one of the five recognized senses; red Pikmin have noses (smell), yellow have ears (hearing), blue have mouths (taste), purple have fine hairs on their heads representing touch and white Pikmin have superior sight to the others. In the Pikmin Short Movie "Occupational Hazards", a red Pikmin is seen going through a Warp Pipe while collecting some Coins, then emerging with dust forming Mario's hat and mustache on its face. Sound effects and the first seven notes of the Ground Theme from Super Mario Bros. can also be heard. This page was last edited on March 14, 2019, at 00:37.